Über RINO Dede Scozzafava has quit the race for the NY-23 congressional seat. 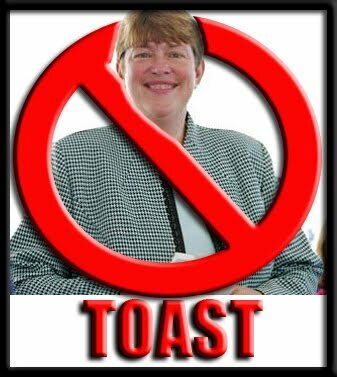 She quit after the release of the Siena College poll this morning. Stacy McCain is reporting that Scozzafava will give her support to Doug Hoffman. The Siena College poll follows what the previous polls showed Owens with a one-point lead over Hoffman and Scozzafava behind by double digits. What is not clear now is where will her supporters go. Were her supporters really liberals who did not like Owens or were they Republicans with party loyalty? Whether Hoffman wins, loses or draws notice has been served to the GOP today. The conservative base has sent a clear message to the GOP, get back to your roots or else. This upset should boost Marco Rubio’s chances against mega RINO Charlie Crist in Florida. Will the GOP heed that message? The latest info from the very exciting NY-23 race comes from two stories in Politico. First we have Republican National Committee Chairman Michael Steele saying that a Hoffman win is a GOP win. Referring to the numerous prominent Republicans who have bucked the party establishment and endorsed Hoffman, Steele pointed to his own responsibilities as party chairman. Ok so you cannot pick and choose, but as the National Committee Chairman, I think if you held your nose every time her name was mentioned, they would get the point. Not quite Mikey, the referendum would be that the base is sick and tired of the GOP slapping R on the end of the name of anyone with a pulse. Put out the word loud and clear, the people want principled candidates! Joe has had a few incidents of low turn out when he has headlined and considering he Bagdad Bob impersonations with touting the Stimulus, I would count Biden as credible support. The White House is sending Vice President Joe Biden to upstate New York to campaign for Democrat Bill Owens in a last-minute push to help Democrats pick up the longtime Republican House seat. The Biden rally will be taking place next Monday morning in Watertown. 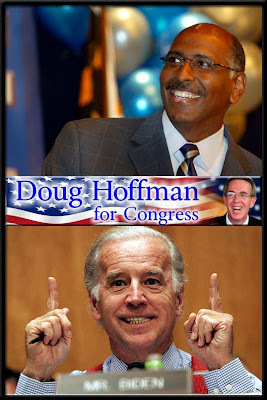 The Biden event comes the day before the special election, which has turned into a two-way contest between Owens and a third-party Conservative challenger, Doug Hoffman, who has captured the momentum in the race in the last several days. On Friday, the White House under a blog title “Transparency like you’ve never seen before” released a partial list of 481 visitors to the White House spanning from January 20 to July 31. Under the very same blog post the White House admits that this is a mere spit in the bucket. A lot of people visit the White House, up to 100,000 each month, with many of those folks coming to tour the buildings. Given this large amount of data, the records we are publishing today include a few “false positives” – names that make you think of a well-known person, but are actually someone else. In September, requests were submitted for the names of some famous or controversial figures (for example Michael Jordan, William Ayers, Michael Moore, Jeremiah Wright, Robert Kelly ("R. Kelly"), and Malik Shabazz). The well-known individuals with those names never actually came to the White House. Nevertheless, we were asked for those names and so we have included records for those individuals who were here and share the same names. So with about 100,000 visitors a month over six months we get about 600.000 visitors. Yet the White House only coughs up 481 names. Transparency like we have never seen before, looks an awful like cheekiness we have never seen before. Furthermore, this partial list seems to have been a wee bit of a Trick or Treat surprise. On the list, names like Bill Ayers, Jeremiah Wright and Malik Shabazz show up, and of course some folks immediate believe those were the real ones. 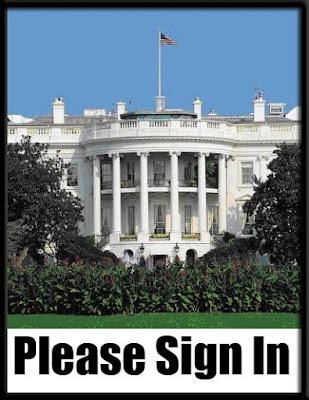 Well it turns out that those name are fake names by people signing in for a public White House tours. However, not all eyebrow-raising names were fake. George Soros came to chat with Larry Summers and SEIU Union Chief Andy Stern practically lives there with 20+ visits. Update: And while we're on the subject of the SEIU, here's an interesting entry: On March 3, ACORN spokesman Scott Levenson met with White House political affairs director Patrick Gaspard, who came to the White House from SEIU. Unsurprising, given the groups' close ties. I wonder what they talked about. Yeah I wonder what they talked about too! Happy Halloween! 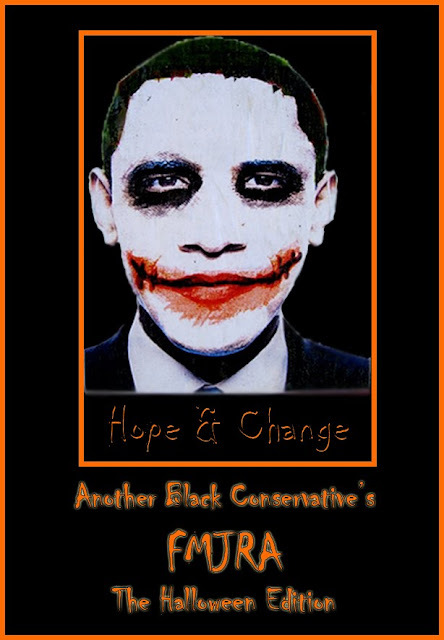 This week’s FMJRA is brought to you by the fright that is Hope and Change. If you are looking for something extra spooky tonight, just check out Nancy’s 2,000-page horror story of socialism called HR 3962! It will make your hair stand on ends! All kidding aside, despite Technorati’s brain dead update, I was once again able to put together a weekly FMJRA. Apologies upfront for anyone I missed. Just drop me an email and I will be happy to give you some props and show you a little Linky Love. 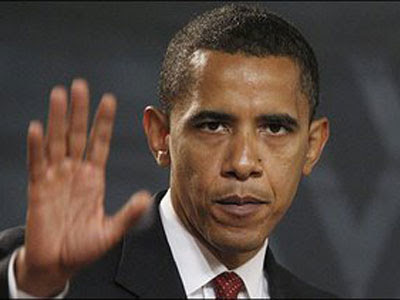 This week’s most linked story was Obama Declares H1N1 Emergency. You guys provided some very interesting feedback and I don’t feel so weird about not being sufficiently alarmed. Thanks to Jules Crittenden, Ed Driscoll and Booker Rising. Zandar Versus The Stupid linked with some snark, but no hits to my Sitemeter. Is this an instance of unrequited Linky Love? Newt Gingrich foolishly thinking that he can toss in his hat in 2012, brought links from Boom Boom Boom and The Lonely Conservative. Zandar Versus The Stupid snarked again and again not a blip on my Sitemeter. Zandy, I can call you Zandy right? Does anyone read your blog? Just askin’ [Clifton B, taps the Sitemeter to make sure it is working]. ABC showed up on a few folks FMJRA this week. No Sheeples Here had a special one featuring Non Presidential Approved stuff and I was happy to make that grade. Fisherville Mike, Reaganite Republican and Keith’s Sports Journal included ABC in their FMJRA. Left Coast Rebel did a FMJRA that included my FMJRA, because like me he ain’t feelin’ the New Techorati either. ABC got a little spotlight action from And It Goes In Shreveport who made ABC featured blog and Camp of the Saints who gave me a quote of the day. Miscellaneous Linky Love came from The Daley Gator who noted Biden’s counter terrorism plans for Afghanistan. 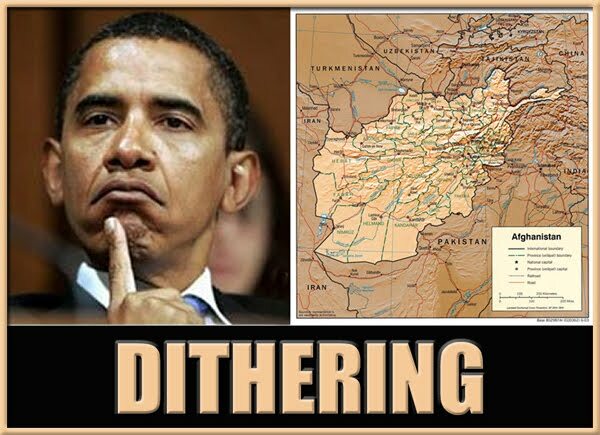 Booker Rising also too a look at Obama’s dithering in Afghanistan. Boom Boom Boom hopped into the time machine to quote ABC on the Quantity of Republicans vs. the Quality of Republicans [Boom Boom also loves that picture of Sgt. Crowley helping Skippy Gates down the White House stairs]. Finally special props to my blogger buddy Left Coast Rebel who really knows how to hit the Sitemeter [hear that Zandy]. LCR linked Sarah expressing support for Christie and McDonnell, The Viticrat video and The White House vs. Edmonds.com. I am skipping the Must Reads this week because I plan to blog about the two stories instead. Plus, I am going to give you all my first hand account of the Chris Christie rally I went to last night, I have some pictures too. Note: Again I am having a busy week in real time. Please hang in there. I promise to make it worth your while by the end of the week when I will have two very BIG announcements. “The most honest, most open and most ethical Congress in history” – NOT! "The American people voted to restore integrity and honesty in Washington, D.C., and the Democrats intend to lead the most honest, most open and most ethical Congress in history,"
As they use to say in the old Virginia Slims cigarette commercial, you’ve come a long way baby! 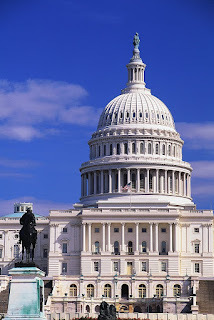 The Washington Post is reporting that dozens in congress are under ethics inquire. Well with this leak, tracks will be covered and no doubt investigations stymied. I wonder if this was no accident? Read the whole article so that you can see some of the jokers that were being looked at. Honest, open and ethical my foot! Too bad the Obama administration doesn’t have to stomach to take on America’s real foes like they do with anyone who seems to disagree with “their version of the truth”. Today the White House has chosen to battle, Fox News, The Chamber of Commerce, Rush Limbaugh, Insurance Companies and you can even add the CIA. The White House’s latest war is now with Edmonds.com for disputing the success of Cash For Clunkers. It is an odd, and we'd say regrettable, pattern of this White House that it lets itself get dragged down into fights with specific media outlets. George W. Bush experienced acrimony with the New York Times, but for the most part, other than general frustrations of a conservative administration, complaining about a liberal media, it was no big deal. But in addition to Fox News, now The White House is going after highly-respected and influential car site Edmunds.com. They're actually using The White House blog to dispute the site's analysis of Cash-For-Clunkers (via Detroit News). The post is snarkily titled: "Busy Covering Car Sales on Mars, Edmunds.com Gets It Wrong (Again) on Cash for Clunkers"
Seriously, what's the point of this? Clunkers is over. It just makes The White House look thin-skinned, though it's great publicity for Edmunds. And yes, Clunkers massively distorted this morning's GDP number, as we demonstrated here, but we're with Edmunds that it was a giant waste with little long-term benefit. Perhaps if General McChrystal wants the administration to stop dithering, he should find a way for the Taliban to dispute a White House claim, then maybe Obama and his minions will find the stomach to fight a real war. You can read Edmonds’ original analysis of Cash For Clunkers here and their response to the White House here. Add another Republican to the growing list of endorsement for Doug Hoffman. 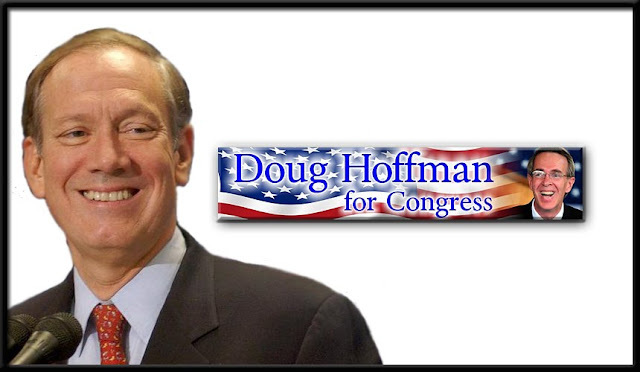 Today former New York State Governor George Pataki has endorsed Doug Hoffman for NY-23 congressional seat. What is surprising here is that according to Politico, Pataki is endorsing Hoffman despite several of his former staffers coming out for Scozzafava! Is CNN Looking For Their Own Little Fight With The White House? I guess coming in last and watching Fox’s rating soar, has turned on a light bulb at CNN. After getting Valerie Jarrett to eat crow, Campbell Brown has decided to go for broke and call out the White House for its obvious bias. I think the White House clearly bit off more than they could chew by asking other news organization to marginalize Fox. What happened was that the media realized they created a monster in Obama. Sure they are happy to carry his water on their own accord, but it is something else entirely when Obama tells them to carry it. Get the Jiffy Pop ready, something tells me this ain’t the last we will see of CNN nipping at the White House’s heels. Now that the Daily Kos poll is out showing Hoffman only one point behind the Democrat Owens and Scozzafava dropping to last place, the NRCC is now sounding a welcoming note to conservative upstart Doug Hoffman. Therein lies the problem for the NRCC. 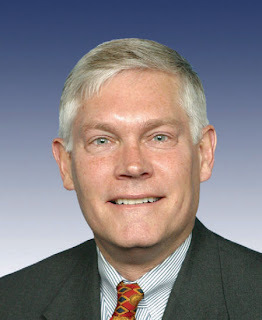 “That message” as Pete Sessions puts it, is the message that the GOP should be putting forward regardless of where the race is held. It is my believe that one of the very reasons why Chris Christie stands a very good chance of losing on Tuesday is because he has put forward a very weak conservative message against the huge tax and spend Corzine. Even now Christie is wasting time getting into a “fat fight”. On Tuesady should Doug Hoffman pull out a win, there will be shockwaves sent though both the Democrat and Republican parties. Both parties would have been served notice that the electorate is more than willing to support third party candidates that have their heads screwed on right. Call it the Beer Summit 2.0. Could it be that Obama is capable of creating a lasting peace with a couple of beers? I am not too surprised by this; remember that photo of Crowley helping Gates down the stairs as Obama marched on towards the cameras? 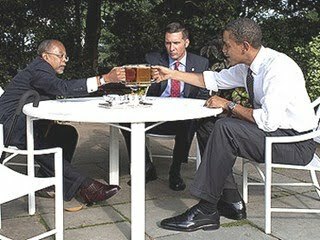 Maybe, Obama plans to use a beer summit to get Al Queda and the Taliban to chill out in Afghanistan? Harvard Professor Henry Louis Gates and Cambridge police Sergeant James Crowley were spotted at a pub in Cambridge Wednesday night. The owner of "River Gods" told WBZ the two sat in a booth together and talked for about an hour. Over the summer, Crowley arrested Gates for disorderly conduct while responding to reports of a possible break-in at Gates' home. Gates accused the officer of racial profiling. Today Nancy Pelosi announced with glee the House’s 1,990-page health care reform monstrosity HR 3962 (PDF version of HR 3962 is found here). Buried within this labyrinth of deceit are 13 new taxes to hit your pockets. Americans for Tax Reform has provided the detailed list below. Left Coast Rebel has reactions to the bill here. Quite frankly this is crazy. Obama assigned McChrystal to handle this region, now he is second guessing the guy all over the place. I don’t see how officials in Washington who never fought a war could possibly know better than the general who is actually on the ground. To make matters worse, counting on local provinces to do their own policing sounds like a sure fire way to completely lose control of the situation. I could understand Obama’s plan better if the US already had full control of the situation, but we don’t. So giving up control here and there seems like the best way to fracture our over all effort and makes it a whole lot easier for Al Queda to surge further by picking off one province at a time. 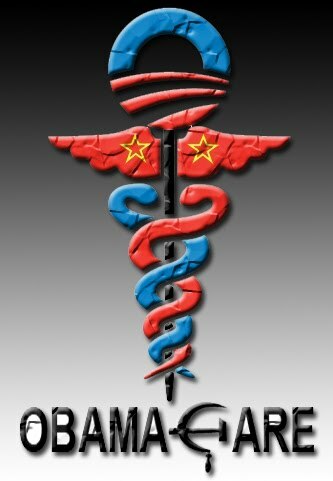 Basically Obama is doing everything he can to avoid sending more troops, a move that is sure to anger his base further at a time he needs their support to get his health care agenda through. The whole thing is just a shame. 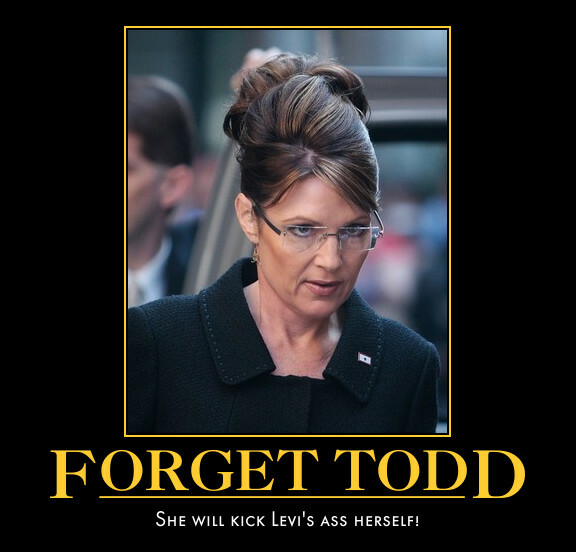 Yesterday, dead beat dad turn gigolo, Levi Johnston stated his latest lie about the Palin family. This time he says that Sarah Palin calls her downs syndrome baby Trig “retarded”. Johnston also told Rodriguez he's been hearing a lot about his saying in a recent first-person tell-all in Vanity Fair magazine that Palin routinely referred to her baby, Trig, who suffers from Down syndrome, as "retarded." "I was just in shock for the first time I heard it," Johnston recalled for Rodriguez. "And then she'd say it regularly. And I think she was joking, but it doesn't make it right." Can we have a little perspective here? Why are we to believe Levi Johnston? This is a boy who completely abandoned his child so that he can make money trashing his child’s grandmother even if that means exposing himself in the center of a magazine. Yet we are suppose to believe on face value that he is shocked over anything. Oh, please. Well Sarah Palin isn’t letting the little dead beat go unanswered. Sarah Palin issued the following statement. Palin also attacks CBS, which aired the first part of an interview with Johnston on “The Early Show” this morning. “CBS should be ashamed for continually providing a forum to propagate lies. Consider the source of the most recent attention-getting lies -- those who would sell their body for money reflect a desperate need for attention and are likely to say and do anything for even more attention,” Palin says in the statement. Palin is right, why is CBS giving Johnston a forum without any proof of what he says. Basically, Johnston can make up anything he wants to keep the gravy train rolling. The problem with Levi’s plan to get rich trashing Palin is that Levi sinks deeper into the gutter with each new appearance. First he dumps Bristol, then abandons his son, then tries to make money trashing Sarah and now he is exposing himself. The only people who are really eating this up are the same folks who hated Palin all along. Everybody else is just turned off by the train wreck called Levi’s life. ABC News’ Rick Klein reports: Former Gov. Mitt Romney is resisting the temptation among potential 2012 candidates to jump into the contentious House race in upstate New York -- but he told reporters in Virginia today that his lack of endorsement is itself something of a statement. “I have chosen not to endorse the Republican in the 23,” Romney, R-Mass., said while campaigning for GOP gubernatorial candidate Bob McDonnell. That has to be the lamest excuse I ever heard. Mitt Romney is clearly a GOP leadership darling so it is no wonder he won't come flat out against Scozzafava. By not picking either side, Mitt hopes to have his cake and eat it too. I don't think that is going to work. Mitt can use all the conservative street cred he can get. 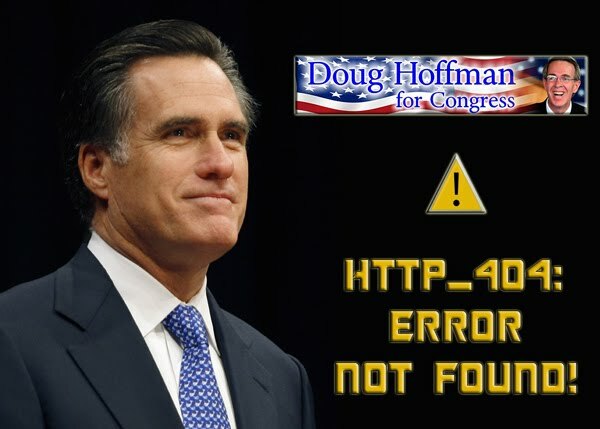 Since Mitt had to sit out much of the battle against ObamaCare, so as not to remind people about RomneyCare he needs something that would put him back in the game and a Hoffman endorsement could do the trick. Conservative Ad Touts Dede Scozzafava's "Progressive Credentials"
Politico is labeling this ad a political dirty trick. I say it looks more like truth in advertising. At first glance, the group’s ad looks like it’s an endorsement of Scozzafava. But it’s a dirty trick engineered by Hoffman supporters, looking to render her unacceptable to many Republican voters by detailing her liberal position on gay marriage, support of President Obama’s stimulus and connections to labor. The group Common Sense in America turns out to have ties to the Club For Growth which is now fully behind Doug Hoffman. In tracking down information about Common Sense in America, it’s clear they don’t have the best intentions for Scozzafava in mind. The group, which was founded on October 23, is headed by Arkansas businessman Jackson Stephens, a board member of the Club for Growth. The Club for Growth was one of the first groups to endorse Hoffman. Stephens donated the maximum $4,800 to Hoffman’s campaign, and is one of the Club for Growth’s leading donors. Calling the group’s phone number – listed on the advertisement – led me to a voice mail from Stephens, which directed all questions about Common Sense in America to Dan Blum, a communications consultant who is serving as a spokesman for the organization. According to FEC records, Blum worked for the Republican National Committee as a staffer as recently as this January. "Common Sense In America, LLC was recently founded for the purpose of providing factual information about the positions taken by candidates for Congress," said Blum. "The purpose of this ad, produced independent of any other organization, is to give voters undisputed facts about candidate Dede Scozzafava’s positions. Ms. Scozzafava is clearly and indisputably on record supporting the Obama stimulus, card check, and gay marriage. These positions would make her an ideal candidate for progressive voters in New York’s 23rd congressional district." Mr. Blum is right Dede would be the perfect candidate for progressives and they can have her. Go Hoffman! Well bravo to Cambell Brown for asking about how the White House feels about MSNBC. Notice Valerie did not have an answer for that one. That is why she quickly starts talking in generalities rather than about Fox directly. The White House is clearly losing the war on Fox News. The latest Nielsen ratings show what we all could have guessed, Fox’s ratings are up! If there is one thing I really cannot stand about this administration, it is the way they act like they are the keepers of the truth. They label everything that is opposed to their agenda as disinformation. I really hate to break it to them, but the man sitting in the big chair is no George Washington! Another Poll Puts Doug Hoffman In The Lead! CFG Poll: Hoffman Takes The Lead! The War On Fox News: Fox Gaining Allies? Say What? Obama Wins Nobel Peace Prize????? ?